Clock-in and Clock-out with Calamari. This innovation does not require any action from your employee. 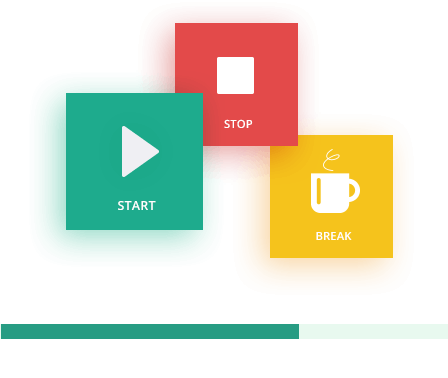 Track time with iBeacon technology, QR code scanner and other useful clocking methods. This simple and easy to use tool offers many features including employee time tracking, timesheets, manual time entries and approval flow. Many ways to clock in! An innovative way to measure work time. Bluetooth iBeacons are small battery-powered devices. They signal a location to nearby phones. After getting the signal from the device Calamari knows if your employees are in the office or not. No action is required, only a mobile phone with the Calamari app for each of your employees. iBeacons works simultaneously with other punch in methods. Find the best for you. Clock in and out with any action! Calamari recognises who is present at the office and start shift automatically. Print out identifiers and distribute it to your employees. Then you will have to install the Calamari QR Terminal app on a mobile device (tablet or smartphone with good quality camera). Mount this device near the entrance to an office and let employees clock in by scanning their QR codes. Web browser clock in option is an excellent choice if you are looking for a simple solution. Employees just need to sign in to Calamari and use start/stop buttons to open the shift or mark breaks. If you know the office's IP addresses, you can limit the location of the logging. Calamari provides native applications for iOS and Android devices. Just let your employees on-the-go sign in and use it in a similar way to web application. The mobile app can track GPS location when an employee punches the clock. Can't imagine your daily work without Slack? Calamari gives your team more convenient way to Clock-in and Clock-out, just do it directly from Slack. Simply type “/calamari in” when you start your working day and “/calamari out” when your work ends. Use simple commands to clock in and out. Are you using Toggl to track time in your projects? Great! Calamari is able to synchronize your data from Toggl and transform Toggl’s time entries into a shift in the Calamari Clockin. You still use your favourite tool to track time and enjoy the benefits of Calamari, eg. PTO accrual based on logged time. Calamari provides you convenient API to integrate your company-wide systems. This is the perfect way to measure time if you are an IT company and using some specific access control devices, eg. fingerprint scanners. With Calamari, you can manage attendance of your team with ease. The tool allows you to track attendance with all kinds of breaks (billable and nonbillable), eg. lunch, personal time. With few clicks, an employee can make update your time entries. A manager is notified about all changes in employee's timesheet and then can approve or reject the change. 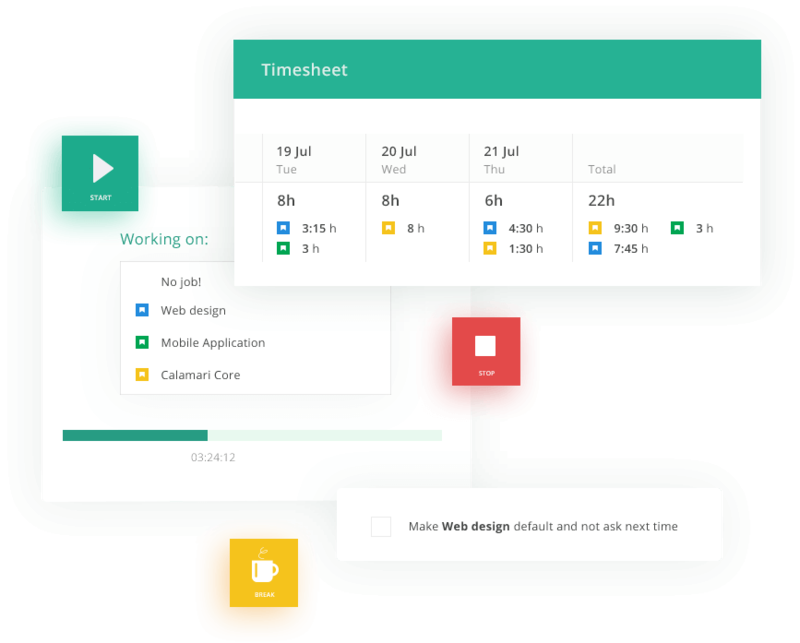 Calamari keeps the full history of timesheet changes so you can keep your eye on it. 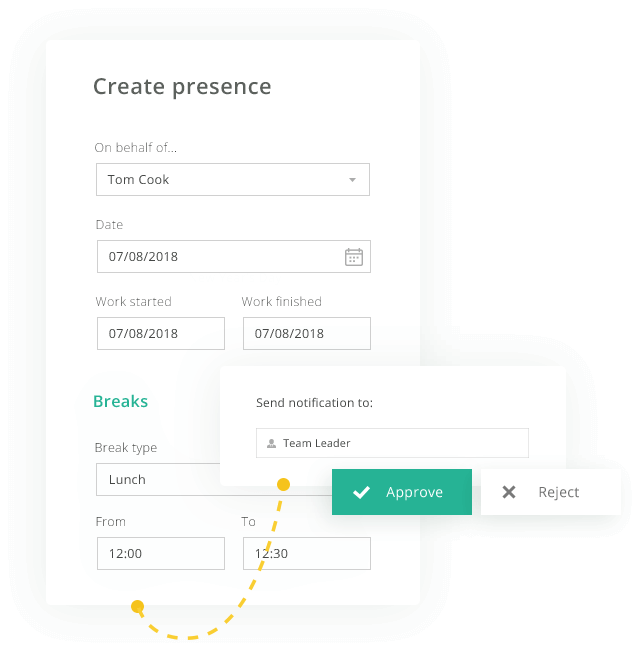 You can set up managers responsible for the timesheet approval. Calamari provides a flexible multilevel approval process as well as the automatic approval for the chosen employees. Calamari notifies you about lates, unexpected absences and other abuses. Just open timesheet and see where are attendance abuse warnings. 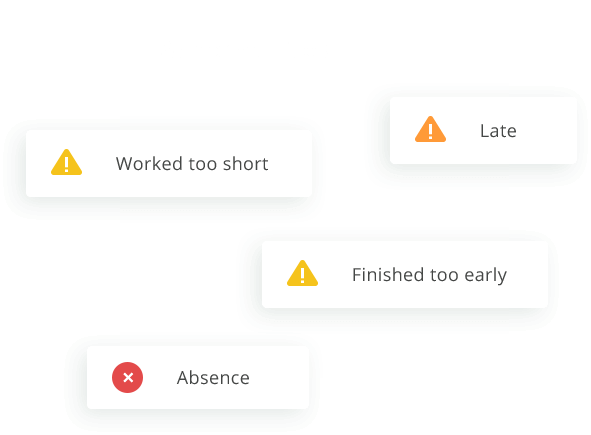 Calamari helps you track the time spent by your team on particular projects or tasks. If you want to understand your true labour costs, you will love this feature. The projects report that shows the number of hours worked, the project name, and the employee makes it easy to understand how the working time of your employees is spent and helps in optimizing team performance and increasing project profitability. Regardless of how your business works Calamari has a solution. Employees can use their mobile phones for the real time clock in or use actionless iBeacons. Calamari has much more other convenient methods QR code scanning, web application or API. Whether your employees work in an office, travel between job sites, or spend the day on the road there is a clocking method that allows you to tack time the place of your employees's work. No credit card required, no commitment.